How to Form an LLC in the State of California under the Statute 17000-17005 and is valid for any resident of California to form a Domestic LLC within the State in order to operate a business. 2 Fill in Application. 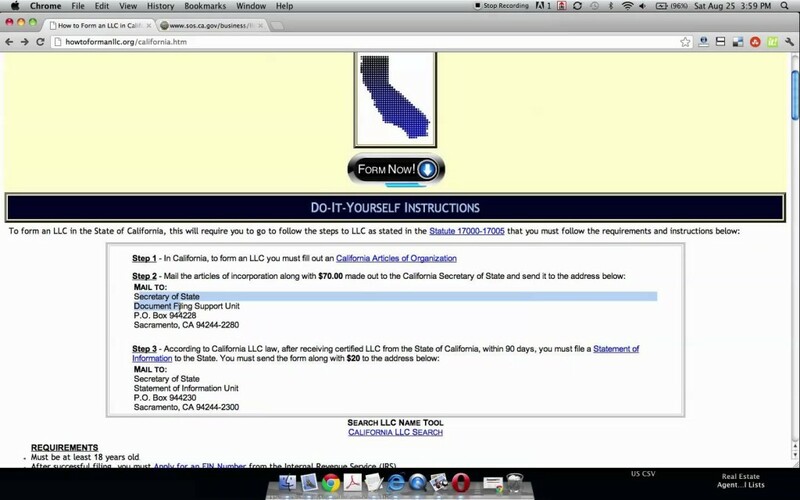 – The official application to form an LLC in California is the Articles of Organization. You will need to completely fill in this form. 3 Send Articles of Organization. – You will need to send your completed Articles of Organization and submit to the California Secretary of State (address below) along with $70. 4 File Statement of Information. – Within 90 days of receiving your official LLC from the State of California, you will need to submit a Statement of Information to the Secretary of State along with a check for $20. Failure to due this last step is a $250 fine. Must be at least 18 years old to form an LLC in California. In order to register a bank account, you will need to Apply for a EIN Number.